Robert Jewett a registered guide, taxidermist, bush pilot, and owner of Top Gun Treks. 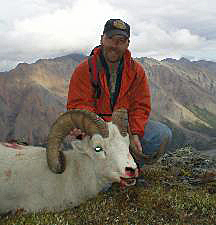 Bob started his guiding career just out of high school as an assistant guide for Alaska guides Ken Bunch and Chuck Moe. 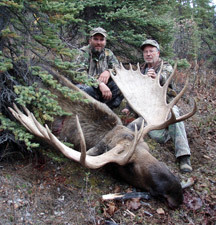 He hunted with these guides as well as others hunting Alaska’s rugged Chugach range. Bob grew up in Ketchikan, in Southeast Alaska, and began hunting deer and bear at a young age. He shot his first big game animal, a 6′ 10″ black bear, on Prince of Whales Island at the age of 14 with while hunting with his 15 year old best friend Scott Pattison. He has guided for and or shot every species of big game animal in Alaska short of polar bear. His passions are God, his Family , his friends, and fishing and hunting Alaska. Pat Donelson (pictured on the left) is a licensed assistant hunting guide who has lived and hunted in Alaska for over 26 years. He is also an experienced bush pilot and holds a Coast Guard license to operate boats in the rivers and inland waters of western Alaska. He not only loves to hunt Alaska, he spends his summers fishing Alaska too. Pat loves to share Alaska with people and spends 5 months per year outdoors doing just that. Pat and his wife are entrepreneurs and have other local Alaska businesses. They own own and operate an Alaska website design and SEO company and a WordPress Managed Hosting Service, Alaska SEO and they formerly owned and operated an Alaska Salmon Fishing Guide business called iFishAlaska Guide Service. He lives in Wasilla, Alaska with his wife of 35 years and has three children. He is an ordained minister and spends the winters traveling, speaking, and ministering throughout Alaska and the lower 48 states.